Millions of businesses are competing for attention on the Internet. What makes the difference between those that appear on the top 20 listing of major search engines such as Google, Bing, or Yahoo, and those that are lost to the endless list of search results? Successful Search Engine Optimization (SEO) makes the difference for online marketing and Konicom makes SEO work for your Web site(s)! Search engine optimization (SEO) is the most effective online marketing strategy to drive traffic to your Web site(s) from any popular search engine. It is a complex process that's now critical for Web sites to be ranked high among the thousands of Web sites competing for attention on the Web. Google, Bing, Yahoo, and other top search engines are crawler-based. These search engines “crawl” through the internet one Web site at a time, collecting data and compiling it into a database that ranks a web site’s relevance depending on what words/phrases are used in a search. For a Web site to achieve top positioning, its structure and contents must be optimized using design strategies that make the Web pages highly relevant when a search engine “crawls” through it. It's true that even the most beautifully designed Web site, populated with attractive graphics, good writing, and valuable products or services can remain virtually "invisible" without professional optimization. Trust our SEO specialists at Konicom to raise the search position of your Web site. It Works!!! At Konicom, our team has years of experience and deep technical expertise in Search Engine Optimization and online marketing. That makes us confident in delivering our promise to you. Here is what our experts do to optimize your Web site to be search-engine friendly: we work with you to define the most important keywords that people use when looking for products or services in your field of business. Then, once we have an understanding of your business goals, we will optimize your Web site(s) to deliver relevant online marketing information to the World Wide Web's major search engines. It’s important to note that the optimization process is not static since search engine algorithms are constantly being modified. For example, a Web site that appears on the first page on Google search this week may vanish into obscurity on page 10 just a few months later. Keeping your Web site near the top of the search results requires ongoing management and redevelopment as search engine criteria changes. Search Engine Optimization provides this highly specialized service which involves monitoring algorithm modifications, adapting Web content, tracking keywords and making appropriate development changes. SEO technical vigilance is the most powerful tool in online marketing for keeping a Web site in the search engine top rankings. Research the methodologies and logic being used by your competitors, identifying keywords and other relevant contents that attract potential customers. Enhance and analyze existing meta tags to make sure they are appropriately configured. Analyze the structure of a Web site, add image alt tags and make changes to better attract search engines. Write effective, optimized Web contents that meet specific search engine criteria. Provide an initial ranking report prior to optimization that will be used to measure our SEO success after search engines recognize the newly optimized structure and contents. The Internet is a dynamic, constantly evolving environment. For a Web site to be selected from among the millions of choices available, it requires more than neatly crafted content and appealing design. Today's top tier Web sites are supported and maintained by SEO professionals with a singular mission to keep clients' Web sites highly visible to search engine crawlers and, consequently, to users looking for goods, services and information. We guarantee top 20 listings for a number of keyword phrases, as specified in the packages, in one or more of 3 major search engines within 12 months upon completion of the initial Web site optimization. The initial Web site optimization can take anywhere between 1 to 6 months depending on the size and the complexity of the site being optimized. The 3 major search engines Google, Bing, and Yahoo. The number of keyword phrases guaranteeing top 20 listings is specified in each package. 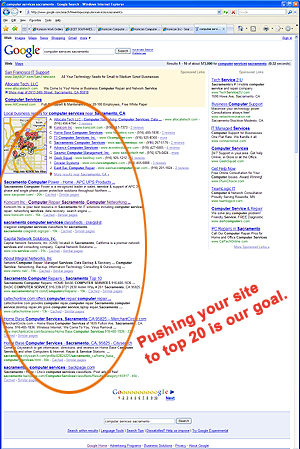 SEO Package requirements are considered met when the guaranteed number of keyword phrases, specified in Client's selected package, shows the website in the top 20 listings of one or more of the 3 major search engines indicated above anytime during the 12-month period starting upon completion of the initial Web site optimization. If SEO Package requirements are not met by the end of the 12th month starting upon completion of the initial Web site optimization, we will honor our money-back guarantee for the entire 12 months. Our SEO packages do not include the cost of third-party services or products that may be necessary for a client's Web site promotion. Third-party services include, but are not limited to, Google Adwords, link building services, press releases, etc. Web sites using all Flash content, implemented with frames, hidden text or script-generated content, containing adult content, or having any offensive language are not covered under our guarantee. Web sites that are cloned or used by more than one domain. Web sites that are modified by a third party after they have been optimized by Konicom. Web sites that are hosted by a server blacklisted for sending spam messages. Web sites that are linked to or being linked from any adult website. Client's Web site must be hosted by Konicom. Web site Hosting fees are charged separately from SEO packages. SEO packages require an initial 12 month commitment without early termination. SEO monthly fees during the initial 12 month Web site optimization period are non-refundable unless honoring our money-back guarantee. The money-back guarantee can only be honored 12 months after the initial Web site optimization. SEO packages are renewable only in 12-month increments. Don't miss our success stories.